Off-topic: what will happen to my tungsten cube? In her best-selling book, The Life-Changing Magic of Tidying Up, Marie Kondo argues that you should get rid of everything in your life that doesn’t “spark joy”. I have accepted that I will never achieve Kondo-level simplicity, because too many things spark joy: a brass dinosaur my grandmother gave me when I was a kid, a worn penguin tibia I picked up on a beach in Uruguay, an Oklahoma rose rock, the alligator head Vicki brought me from New Orleans, an armadillo skull I found in the woods once, a sliced geode, an ammonite…the list goes on. Every area I have control over becomes, if not a cabinet of curiosities, at least a semi-organized array of curiosities. An old box of stuff I unwrapped over the holidays. The human skull and allosaur claw are casts, all the other natural history items are real. There are a couple of objects in my collection that give me more pleasure than any of the rest. One is a piece of shrapnel from the Sikhote-Alin meteorite – more about that another time, perhaps (done). 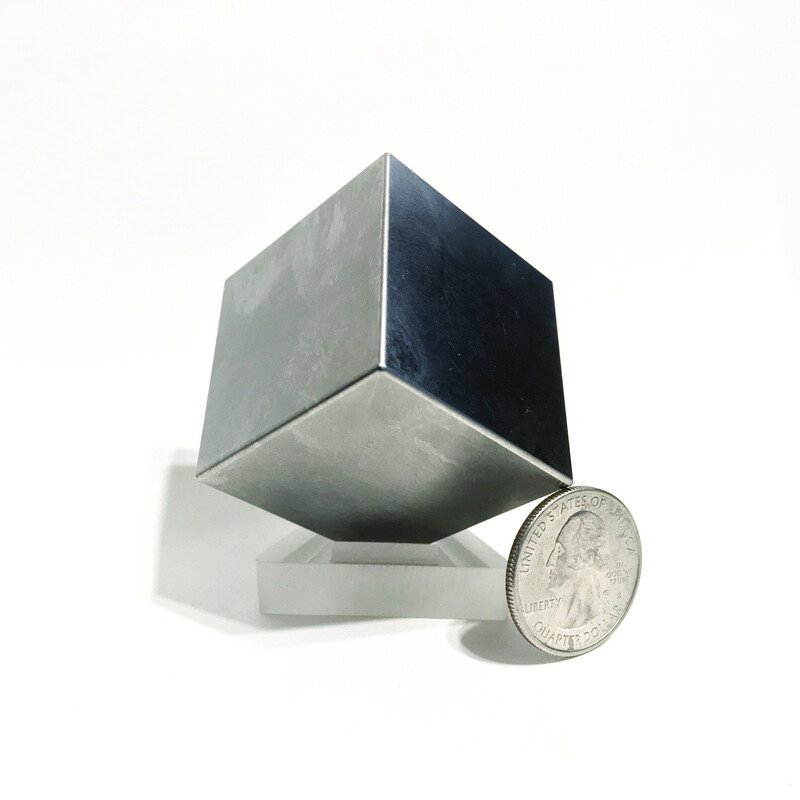 The other is a 1.5″ tungsten cube. Some philistines may not consider this a proper “toy”, but I’ve had one for a year or so and am still crazy about it and have zero regret about purchasing it despite its high cost. It doesn’t do anything other than be way heavier than it seems possible for something that size to be. I think it’s mind-boggling and entertaining just to pick it up, hold it, savor its surreally strong attraction to the center of the earth, and think about gravity, matter, fundamental forces, etc. The next time I got a nice chunk of fun money, I got the pair of 1.5″ tungsten and aluminum cubes sold by Midwest Tungsten Service. And a couple of years on, I gotta say, that purchase has probably given the best return of enjoyment per dollar of anything I’ve ever bought. For two reasons. First, there’s the tactile enjoyment of picking up the tungsten cube. It is shockingly heavy. Pure tungsten has a specific gravity of 19.25. 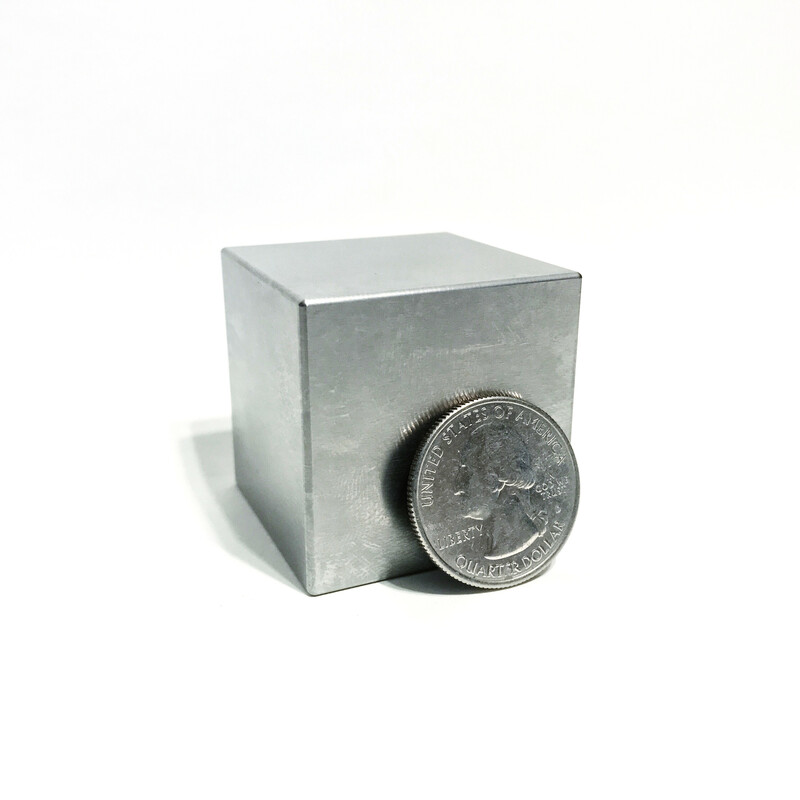 This cube is an alloy of 95% tungsten, 3.5% nickel, and 1.5% iron, called MT-18F by Midwest Tungsten. According to the fact sheet provided with the cube, “The addition of these alloying elements improves both the ductility and machinability of these alloys over non-alloyed tungsten, which can be brittle.” The addition of those other elements brings the cube’s density down to 18 g/cm^3. By comparison, steel is 8.05 and lead is 11.35. So even the alloyed cube still has a density more than half again that of lead. The 1.5″ cube has a mass of almost exactly 1 kg. Even knowing, intellectually, how heavy the tungsten cube is, it’s still a kick in the brainpan every time I pick it up. It feels unreasonably, unnaturally heavy. It’s uncanny, like something out of a comic book, like it’s being pulled downward with the same force I normally associate with strong magnets. The second reason why the cube is so great is the thoughts that it inspires. Pure tungsten has a melting point of 3422 °C (6192 °F). The W-Ni-Fe alloy, like other tungsten heavy alloys, “will begin to form a liquid phase when heated in excess of ~1450 °C (2642 °F)”, according to the Tungsten Heavy Alloy Design Manual (link). According to this page, most room fires max out at about 1200 °C, and according to this page, the temperatures of most magmas are 700-1300 °C (~1300-2400 °F). W-Ni-Fe alloy is also extremely hard, with a Vickers hardness of 262 kgf/mm² (about 8.5 Mohs; regular steel is 4-4.5 and hardened steel is 7.5-8). The only harder substances are things like corundum; carbides of silicon, titanium, and tungsten; boron; and diamond. My youngest brother, Ryan, designs drill bits for the oil industry, and then goes out to the drill sites to see how they wear down. His job is basically getting industrial diamond, tungsten carbide, and hardened steel to play well together at 1100 rpm. I wrote to get his profession opinion on the survivability of the tungsten cube. I’m having a hard time thinking of some natural or accidental process that would destroy it. Volcano, asteroid, and A-bomb are all I’ve come up with. [This was before I’d looked up the temperature of magma.] Like, if it just got left out in the rain and the sun forever, would it corrode? Ever? How long could it be sitting there as a recognizable cube – a century, a millennium, 100,000 years? I don’t have much experience with straight tungsten but WC [tungsten carbide] should fare better corrosion wise, it takes some pretty exotic stuff to corrode it. Now cobalt has a melting point of 2700F so if the WC got that hot the cobalt binder would melt, desintering the WC and breaking it down. However that’s way hotter than your average house fire. Barring any natural disasters, acts of God, or man-made intervention, I would think you could set that thing on the ground somewhere and it would be just fine for a long, long time. Fun fact #1: Pure tungsten oxidizes in air, so I imagine that’s one of the reasons they added the nickel in the MT-18F. My desk at work. 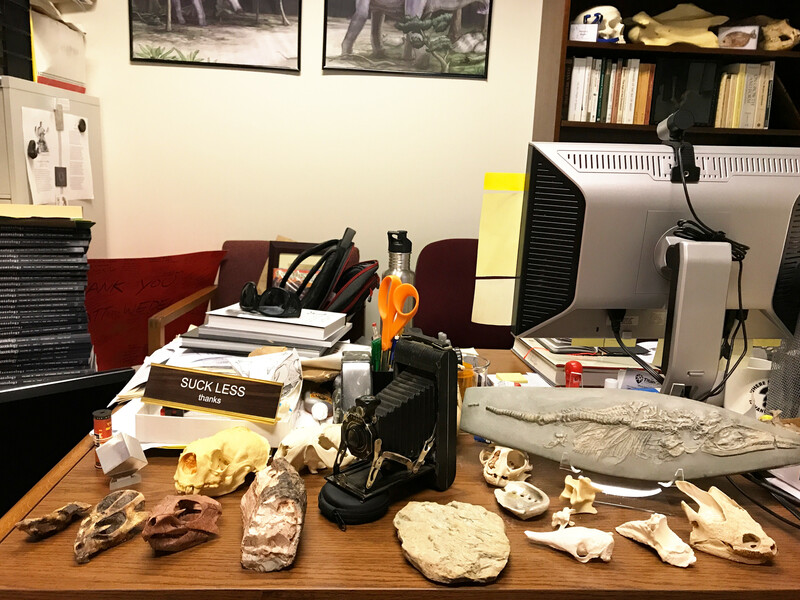 Aquilops and sea otter skulls on the left are casts, the ichthyosaur is a 3D print, and everything else is real and mostly collected and prepped by me. 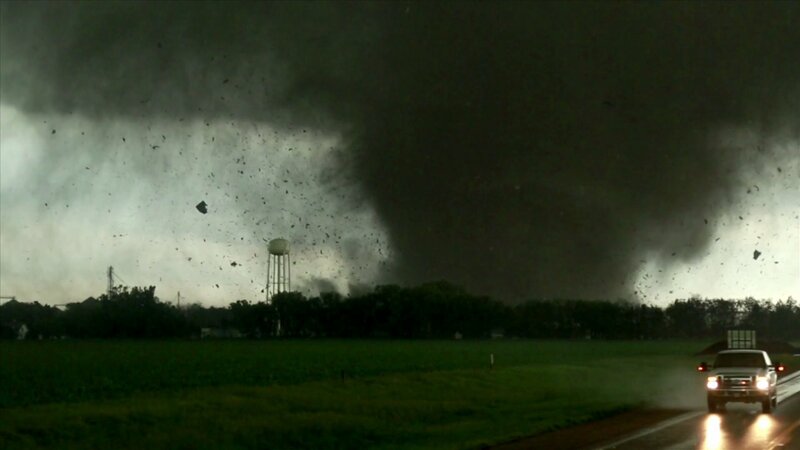 That’s the aluminum cube in the back on the far left. The tungsten cube sits on my side of the desk, where I can play with it. Now, I have a lot of things that I hope will outlive me, including a lot of old books and reprints. And a lot of that stuff is pretty durable, including the aforementioned meteorite chunk. But there is a big difference between holding a century-old monograph and hoping that the people who come after me will care for it, and holding the tungsten cube and knowing that it will most certainly survive for centuries or millennia, unless someone attempts to destroy it, deliberately and with a non-trivial expenditure of effort. And that’s why I’m writing about the tungsten cube here on what is normally my fossil blog. 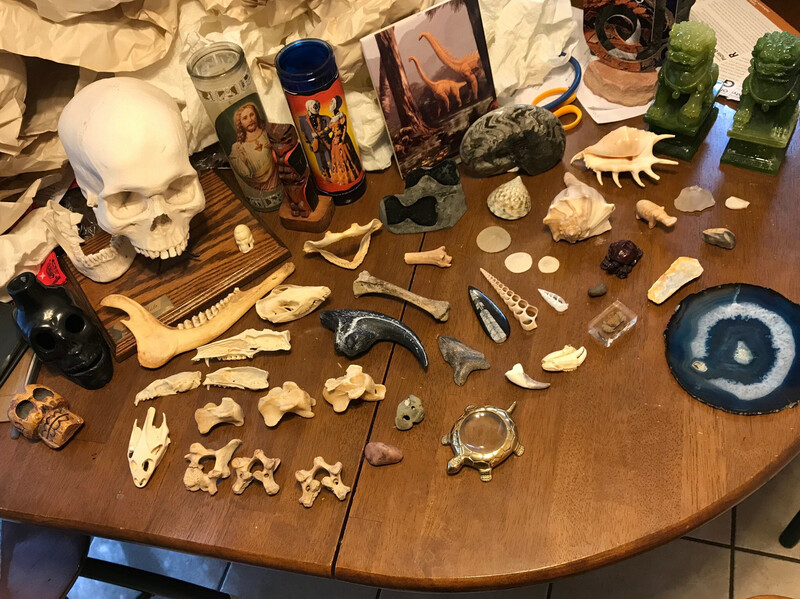 I am surrounded by objects that represent time – developmental time for bones, geologic time for fossils and minerals, astronomical time for meteorites – but these are almost all natural products that embody the past. The tungsten cube is a human product, and in its sheer durability – and survivability – it embodies the future. It will exist in future iterations of this world that I can’t imagine. That’s a breathtaking thought. It’s worth getting the set because the aluminum cube is also entertaining and it’s worth the small additional outlay (as of this writing, $133 for the 1.5″ tungsten cube alone, and $159 for the pair). 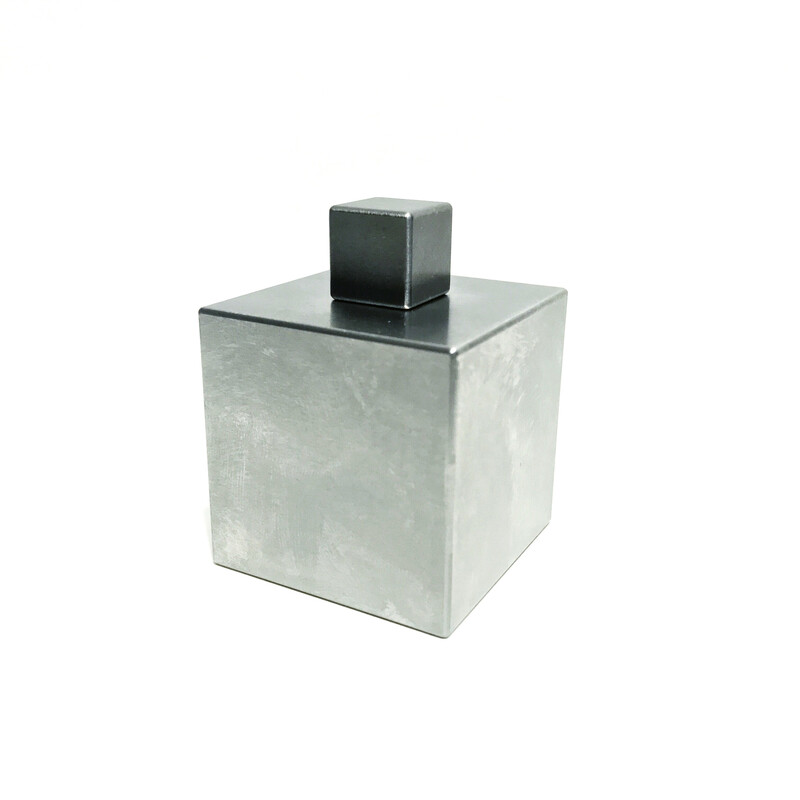 The aluminum cube has a mass of 0.15 kg, exactly 15% that of the tungsten cube. I have visitors pick up the aluminum cube first. It’s funny, I guess a lot of folks haven’t had a chance to play with solid chunks of metal firsthand because they’ll pick up the aluminum cube and say, “Wow, that’s heavier than I expected.” At that point I just smile. The tungsten cube blows people away, every time. Heck, it blows me away every time, and I’ve been playing with it for two years. Highly recommended. For a full line of cubes, spheres, and tops, check out Midwest Tungsten Service (link). Many of their products are also available on Amazon. 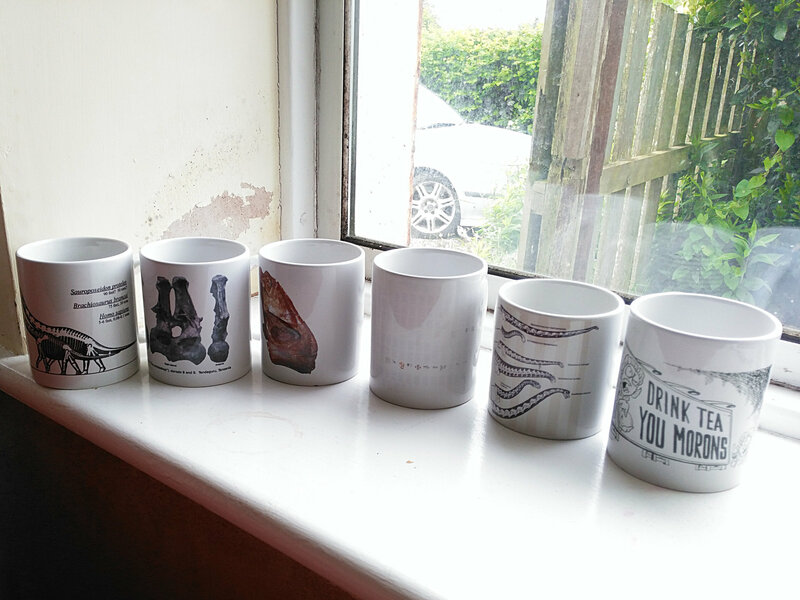 The Sauroposeidon mug that Matt made back in 2000 or so. The first one I created myself: an Archbishop mug, showing the posterior dorsal vertebra pair D?8-9 — foolishly, in monochrome. 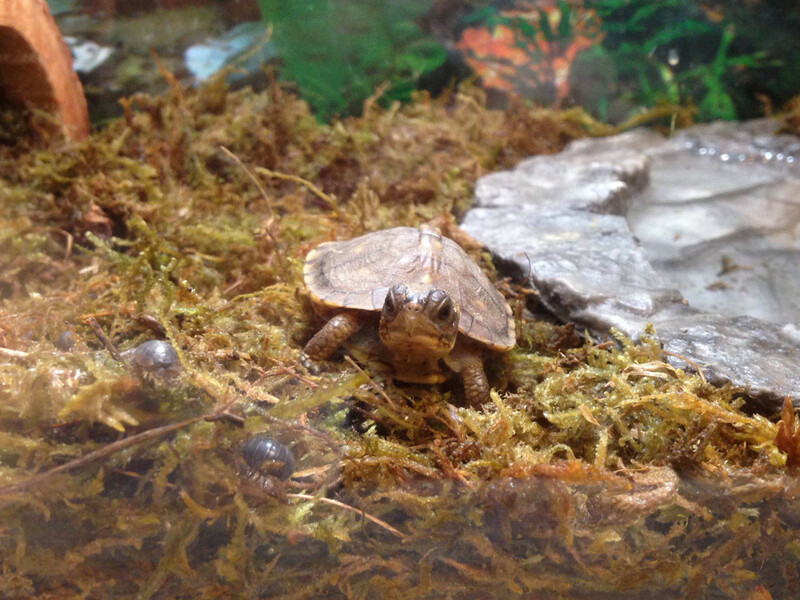 Xenoposeidon, of course, created in celebration of its publication. The whole of my dissertation, printed very very small. The introductory here’s-what-sauropod-necks-are-like illustration from our 2011 paper on why those necks were not sexually selected. 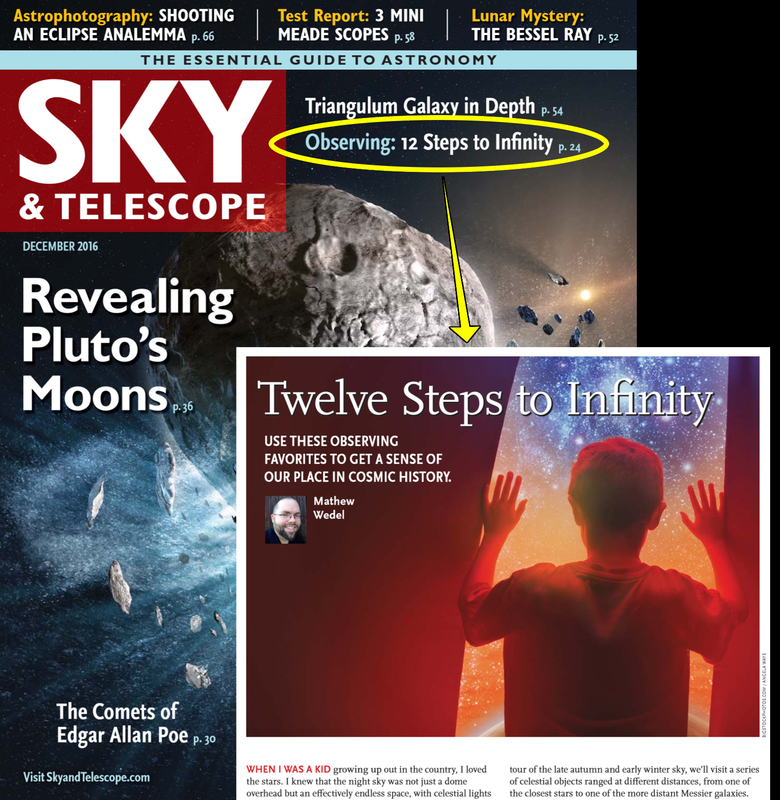 I’ve been writing for Sky & Telescope, the American astronomy magazine, for a year now. My first feature article was published last December (details here), my second came out this April (ditto), and my latest is in the current (December 2016) issue, which should be hitting newsstands this week. I’ve also been writing the “Binocular Highlight” column since June. 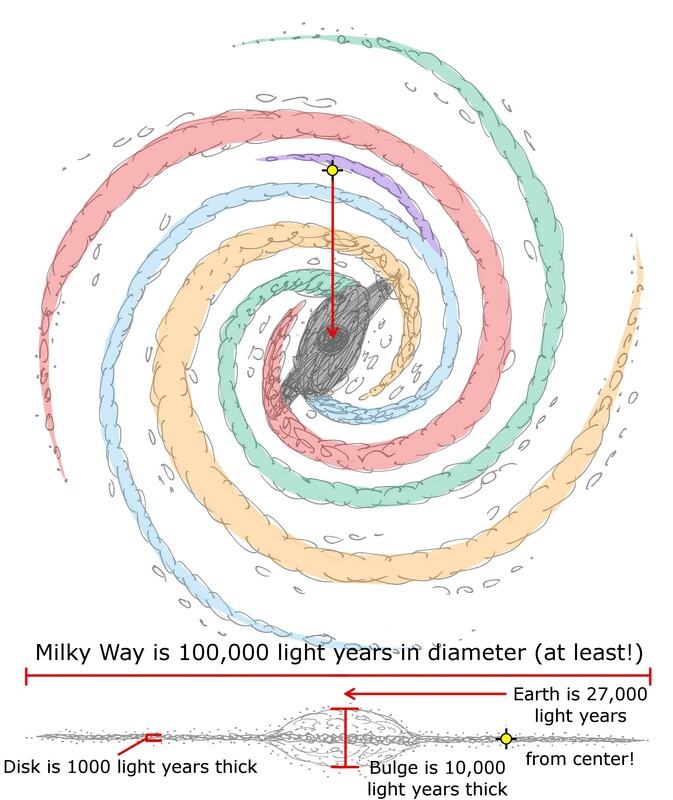 Our place in the Milky Way, from a talk I put together on the same subject. My new Sky & Tel article doesn’t go nearly that far back – in fact, I don’t even make it out of the Cenozoic. But the concept scales all the way out, so if a particular event in Phanerozoic history is near to your heart, there is probably a star, nebula, cluster, or galaxy whose light left at the right time, which you could observe with binoculars or a small telescope (although the distribution is gappy between half a million and 30 million light years, where there just aren’t that many nearby galaxies). The Messier and Caldwell catalogs are good places to start, and there are hordes of online resources (many funded by your tax dollars by way of NASA) you can use to find a match. If I get really motivated I might post a table of easily-observed celestial objects and their lookback times. In the meantime, if you have a date in mind, leave it in a comment and I’ll find something temporally close for you to go look at. Lots of people provided assistance and inspiration. Steve Sittig, who runs the Hefner Observatory at the Webb Schools here in Claremont, helped me refine the idea through numerous conversations, and did a trial observing run with me last autumn. Fellow paleontologists Alan Shabel and Thierra Nalley guided me on hominid history (needless to say, any remaining errors are mine). My editor at Sky & Telescope, S.N. Johnson-Roehr, made numerous small improvements, and the S&T art department made the article even more beautiful than I had hoped. 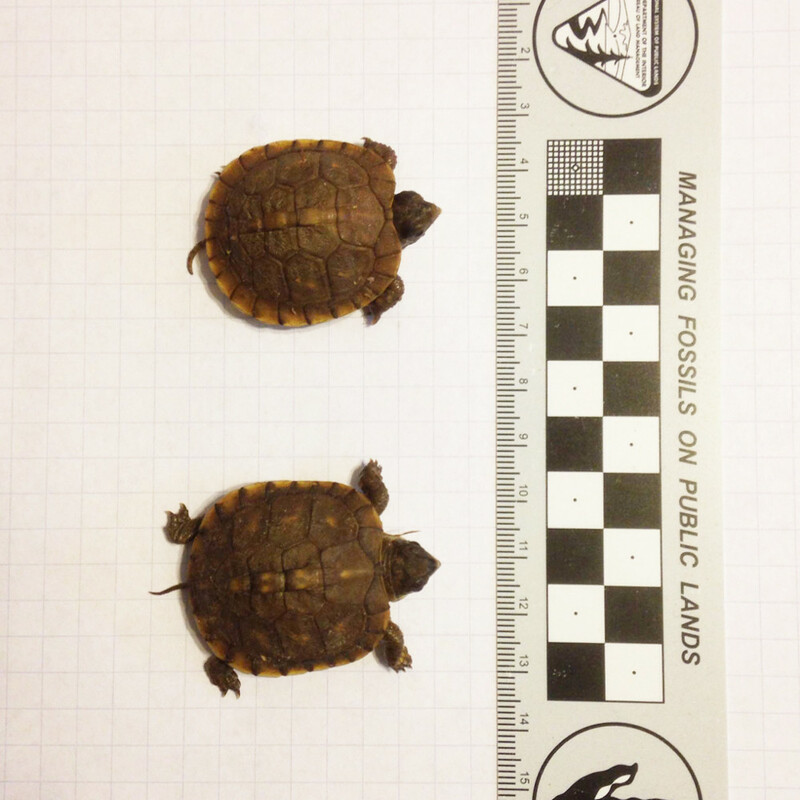 Finally, the little plesiadapiforms at the end of the piece are there thanks to Pat Holroyd, who introduced me to them when I was at Berkeley. Many thanks, folks! * Other contenders: my favorite paleo thing is the RLN paper, and my favorite thing I’ve written about myself is this essay. And that’s quite enough navel-gazing for one post! 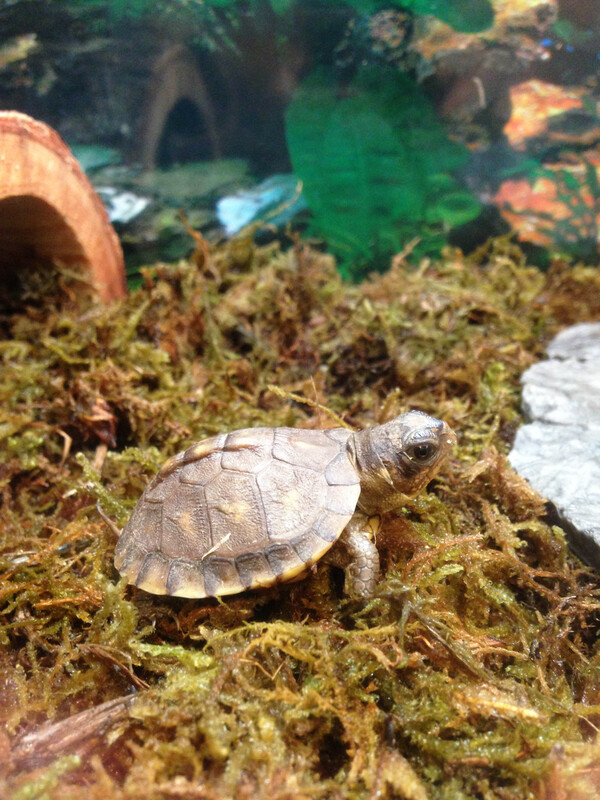 We adopted a couple of 6-week-old box turtles today. 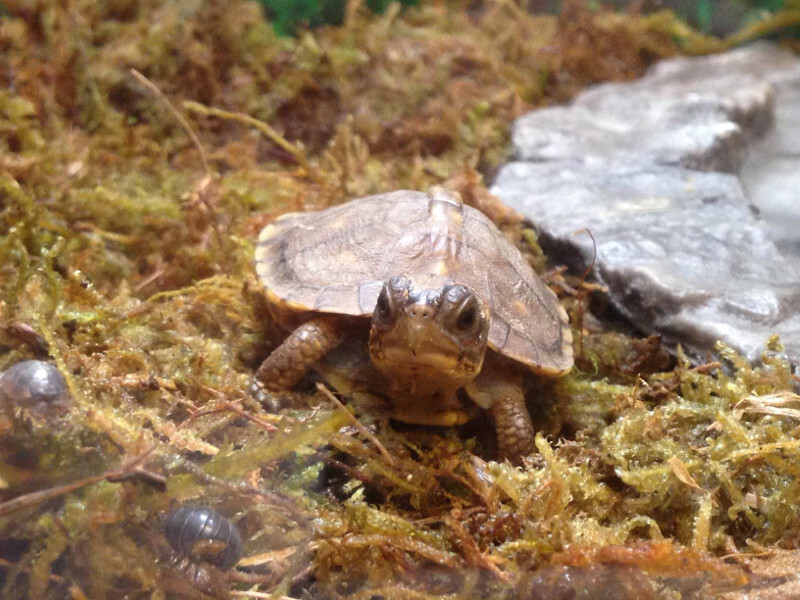 They are Three-Toed Box Turtles, Terrapene carolina triunguis, and they are insanely adorable. This one seemed oddly familiar…had I encountered it before? UPDATE: The last few images here are an homage to Mike’s Gilmore sequence from slide 96 in our 2012 SVPCA talk on Apatosarus minimus (link). I would have linked to it sooner, but I couldn’t find the right blog post. Because there wasn’t one. Memory! 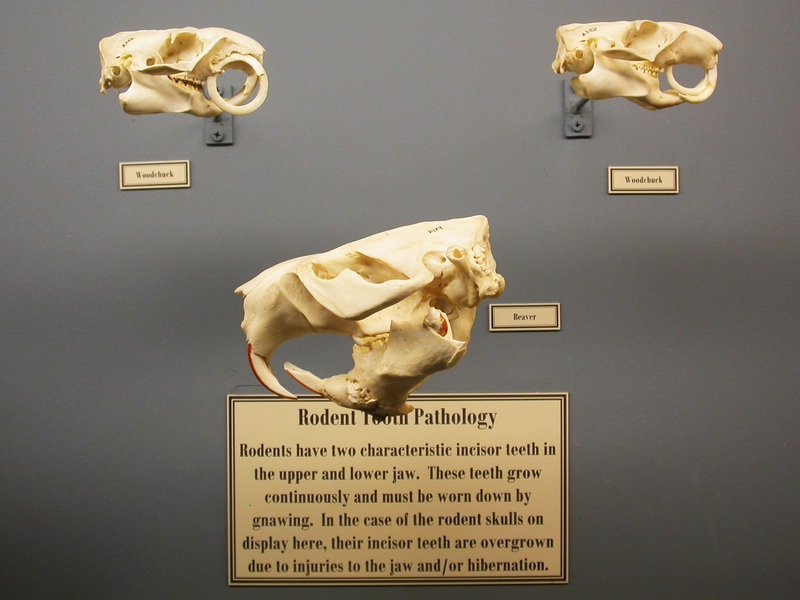 Museum of Osteology: pathological rodent teeth. Also, Cthulhu. Another nice display from the Museum of Osteology in Oklahoma City (previous MoO posts here and here). 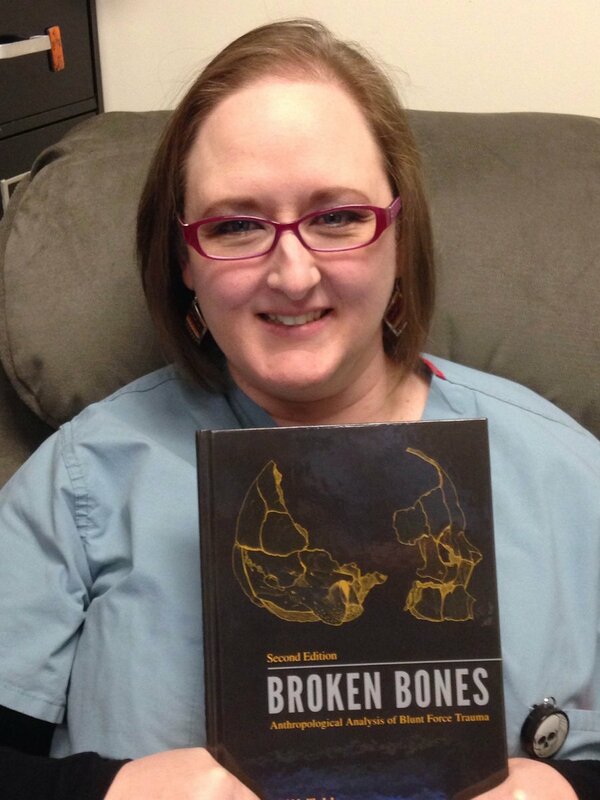 Check out the really gnarly ones that are indeed growing right through the bones of the face. That must have sucked. Back when we started SV-POW!, Mike predicted that the technical niche blog was the wave of the future. That prediction does seem to be coming true, albeit more slowly than I thought it would. Nevertheless, if you are susceptible to the inherent fascination of rodent teeth, get yourself over to Ian Corfe’s Tetrapod Teeth & Tales for more geeky goodness. Now, in a move that will possibly enrage one segment of the audience but hopefully delight another, I am going to forge even further away from the ostensible raison d’être of the blog and talk about monsters. Specifically Cthulhu–in my experience, in the Venn diagram of life, the “interested in paleo” and “interested in Lovecraft” circles overlap almost entirely. 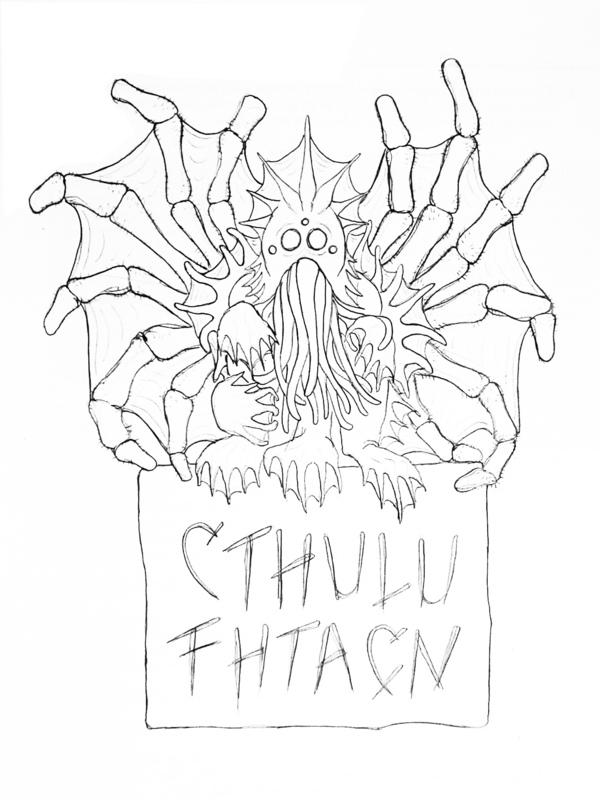 Over at my everything-except-paleontology-and-astronomy blog, I’ve been thinking about Lovecraftiana and wrestling with what a Cthulhu idol, such as those described in Lovecraft’s stories, ought to look like. 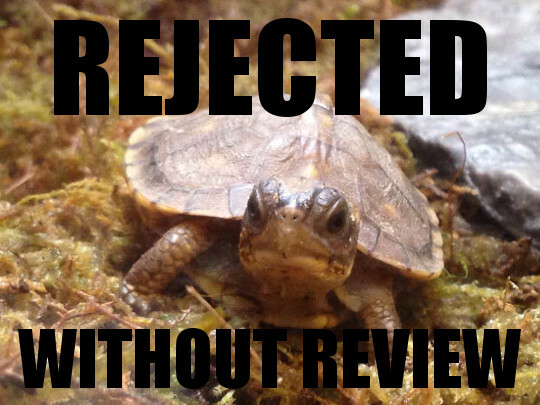 If you’d like to contribute, get on over there and leave a comment. If you send* me a picture (drawing, painting, 3D render, photo of sculpture, whatever) or leave a link, I’ll include it in an upcoming post. Cthulhu fhtagn! 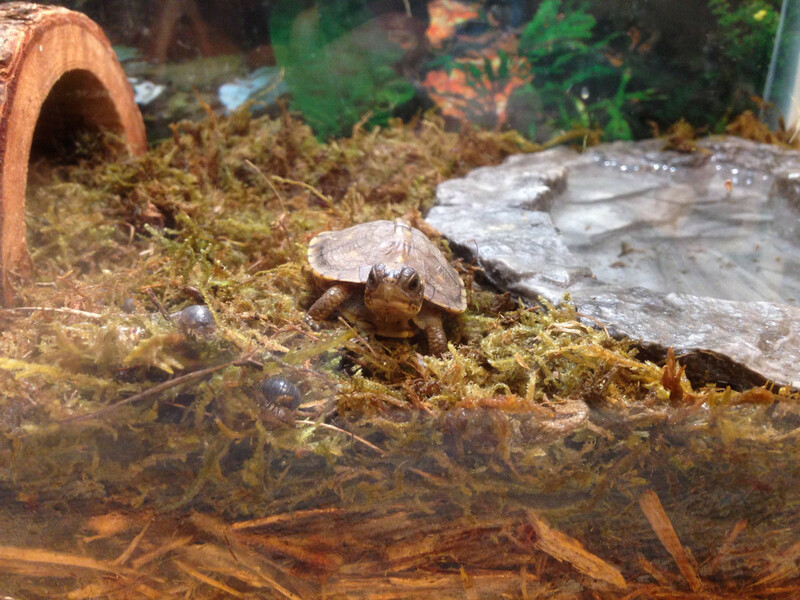 * Send to mathew.wedel@gmail.com, please include Cthulhu in the subject line.